Xipe Totec is a Mexican band formed in 1996. Their first album “Prehispanic Beg” was released through Toaj Records in 1998 and contains ten powerful tracks that vary in sound, but are highly rooted in the Death metal genre. Xipe Totec was primarily thought to act as a self-conscious being, which main goal would be to emphasize the roots of Mexican people. The daily life of Aztec people offered us a vast amount of information that we could transform into song lyrics: The violently conquered Aztec people; the loss of their ancient language; the ancient Mesoamerican history, their cosmological visions, religion and human sacrifices. All of which fits perfectly within the death metal genre. 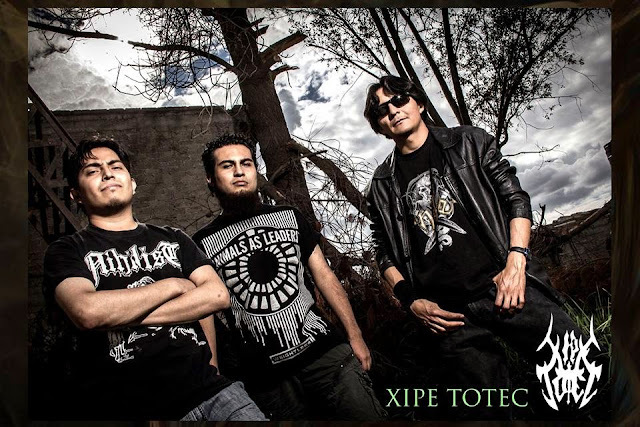 Xipe Totec is considered to be a pioneering band in what today is known as “pre-Hispanic metal”. After several live shows in Mexico, the band split up in 2001 due to internal problems. After thirteen years of their debut, the band reunites again to record a new album. “Eztlacuani” (blood thirsty), released by Ablaze records, was a great success. The latest album titled “In Moyocoyani”, the title makes allusion to the god Ometeolt, also known as Tezcatlipoca. The sound on this album has matured considerably. Once again, lyrics written in ancient Aztec language can be found here, as well as pre-Hispanic instrumentation in all songs.